Being a better news consumer in the digital age is critical! As everyone struggles to deal with information overload and the difficulty in determining the authenticity of news reports, it's more important than ever to learn critical thinking skills that can help us find trustworthy information. This workshop aims to teach us how to identify fact from fiction, news from opnion, and how these skills are important to a democratic society. Join us for a hands-on workshop led by Stony Brook University's Center for News Literacy. Learn how to fight fake news, and why becoming a more discerning news consumer can change individual lives and the life of the country. 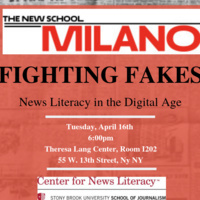 Co-sponsored by the Center for News Literacy at Stony Brook University and the Milano School for Policy, Management, and Environment at The New School.